Streveler signed with the Bombers on May 4th, 2018 and, by the end of the season, had become a household name in Winnipeg. He began as a project quarterback, but after the retirement of Darian Durant and an injury to Matt Nichols near the end of training camp was the club’s starter for opening night. In doing so, he became just the 12th straight-from-college quarterback to start Week 1 for a CFL team since 1959 and the first since Anthony Calvillo with the Las Vegas Posse in 1994. 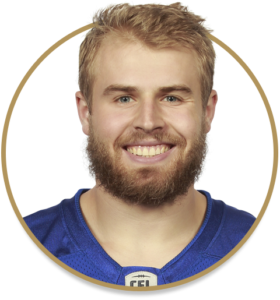 He was also the first fresh-from-college QB to start an opener for the Bombers since John Schneider in 1968. The Bombers went 1-2 under Streveler in his first three starts as a pro, and as the season progressed his role in the offence remained prominent even with the return of Nichols. Streveler completed 61.4 per cent of his passes for 11 touchdowns against five interceptions, while rushing for an additional 441 yards — second on the team to Andrew Harris — and another 10 touchdowns. Those numbers made him the first Bombers QB since Matt Dunigan in 1993 to hit double-digit TD totals through the air and along the ground. Streveler began his college career at the University of Minnesota, playing both quarterback and receiver before transferring to the University of South Dakota. His two seasons with the Coyotes were spectacular, as he threw for 6,081 yards and 54 touchdowns. In 2017, Streveler was named MVFC Offensive Player of the Year and was a finalist for the Walter Payton Award.